Perhaps one of the most important factors in the energy consumption equation is also one of the most overlooked: buildings. In many ways, buildings are essential to a sustainable future, particularly when you consider their architecture, design, construction, operation, and all the many activities that take place under their roofs. Growing energy awareness and reducing electrical demand in buildings can play one of the most important roles in solving our energy challenges on a local, national, and global scale. Thankfully, as a nation, we have experienced numerous technological innovations and improvements in energy habits and practices – such as improved lighting fixtures, windows, insulation, building controls, and appliances, as well as whole-building design and construction. All of these changes provide the ability to implement responsible practices and reduce our consumption – the question is, will you act on it? According to the US DOE Energy Information Administration/ Electric Power Annual 2014 files, the total US consumption of energy was 4,46.2 Terawatt hours (TWh) (illustrated in the graph below). From a global perspective, the US ranks second in energy consumption, behind China in first place and ahead of India in third and that is a ranking that remains true to this day. 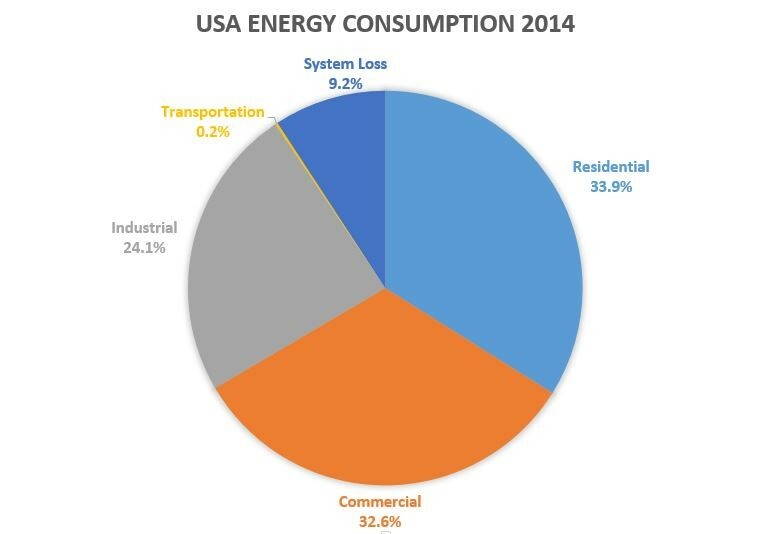 Within the US, the two largest categories of energy consumption are residential consumers (at 33.9%), and Commercial consumers (at 32.6%), followed closely by Industrial consumers (at 24.1%). But what accounts or these energy expenditures and what factors are at play? Population: As a country’s population increases, so do the number of buildings – both residential and commercial – that will be needed to house and accommodate that population. More people leads to more homes, schools, community buildings, shopping centers, restaurants, etc. Economic growth: From collective countries to individual capitalists, it seems that a growing economy is in everyone’s best interest. But what does it mean in terms of energy consumption? As gross domestic product (GDP) rises, so does the need for new floor space in offices and retail buildings. As businesses populate more spaces and (ever more) technology and machinery, their energy consumption rises. Building size: The larger our homes, community buildings, and commercial floor spaces are, the more electricity is needed to light, heat, and power those environments. Service demands: Lighting, space conditioning, powering electronics, and managing process loads all increases the demand for electricity and energy. Real energy prices: Though electrical energy is a necessity in our twenty-first-century world, prices remain relatively elastic – meaning that as the price changes so do our consumption patterns. Spikes in energy prices (or deep discounts) can all motivate us to change our habits and adjust our expenditure. Energy efficiency: As our technological devices and collective consciousness tend toward responsible consumption, we are able to adjust how efficiently our energy service demands can be met. ← Tracking how Electric Vehicles charging effect residential power usage.